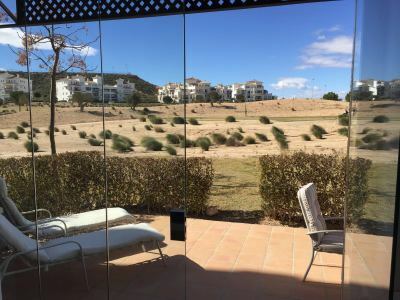 Sucina: A lovely Spanish village, approximately 15 minutes drive from San Javier airport (Murcia) and just under an hour from Alicante. It has a good range of local bars, cafe's and restaurants, catering for both Spanish and English. Plus supermarkets and local shops. Its Church Square is host to the local fiestas, where the current Mayor always puts on a good show. Beaches are within easy reach by car, as is Murcia city. A great friendly place to live. 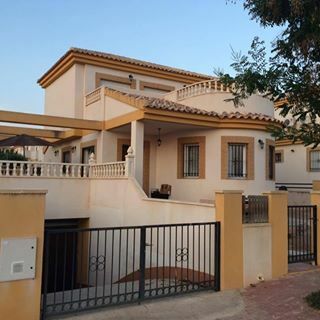 Hacienda Riquelme: Built in 2006, located just 2 miles outside Sucina, is this fabulous gated golf resort, so is within the reach of locations, the same as Sucina. 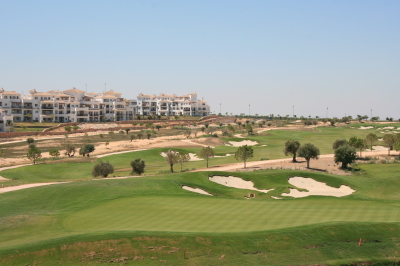 The resort is home to 1,800, 2 bed apartments with shared pools dotted around, and surrounding a championship 18 hole golf course. The original Hacienda has been converted in to a quality bar and restaurant with a courtyard, including a supermarket, open 7 days a week. Security is a top priority on the resort, as are the immaculate kept communal garden areas. Free tennis courts, Paddle courts and 5-a-side/basketball court are available to use, plus an outside gym, and lots of childrens play arears. Ideal for holidays or retirement. 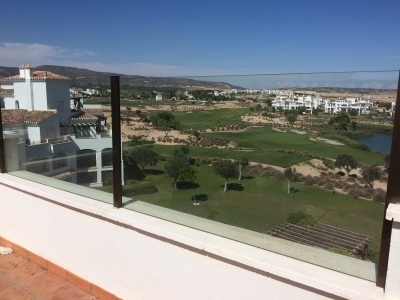 Penthouse 2 bedroom flat on Atlantico . Close to a pool and well furnished with everything you need for a relaxing holiday. British and Spanish TV, DVD, Air Con, Gas central heating, free wifi. Starting at 30 euros a night. Contact us for full quote and availability. 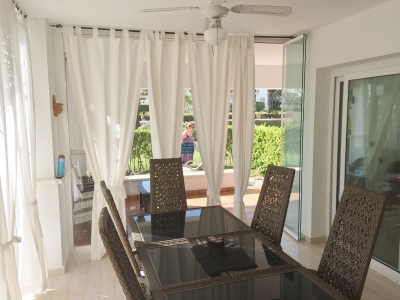 Ground floor 2 bedroom garden flat on Indico, Hacienda Riquelme, with glazed patio. Quality furnished with everything you need for a relaxing holiday. British and Spanish TV, DVD, Air Con, Gas central heating, free wifi. Starting at 35 euros a night. Contact us for full quote and availability. 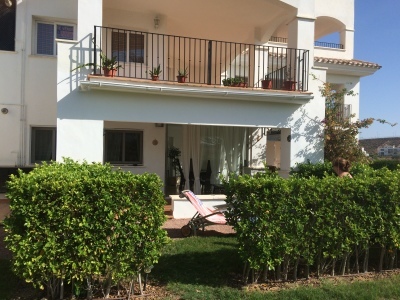 Ground floor 2 bedroom garden flat with an 2nd shower room, on Indico, Hacienda Riquelme overlooking a pool, very close to Hacienda. Glass curtained patio . British and Spanish TV, DVD, Air Con in all rooms, Gas central heating, free wifi. Starting at 38.50 euros a night. Contact us for full quote and availability. 2nd floor 2 bedroom garden flat on Egeo, so about 5 minutes walk to the Hacienda and gate house. 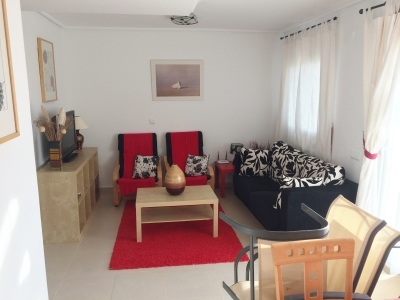 Well furnished with British and Spanish TV, DVD, Air Con, Gas central heating, free wifi. Starting at 30 euros a night. Also available to purchase at 93,000 euros. Contact us for full quote and availability. Ground floor 2 bedroom garden flat on Indico, with glazed patio. Quality furnished with everything you need for a relaxing holiday. British and Spanish TV, DVD, Air Con, Gas central heating, free wifi. Starting at 35 euros a night. Contact us for full quote and availability. 2nd floor 2 bedroom garden flat on Egeo, so about 5 minutes walk to the Hacienda and gate house. 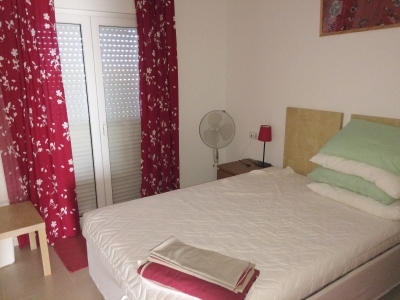 Well furnished with British and Spanish TV, DVD, Air Con, Gas central heating, free wifi. long term 350 euros a month. Also available to purchase at 93,000 euros. Contact us for full quote and availability.